Richard Sudan is a London-based writer, political activist, and performance poet. His writing has been published in many prominent publications, including the Independent, the Guardian, Huffington Post and Washington Spectator. He has been a guest speaker at events for different organizations ranging from the University of East London to the People's Assembly covering various topics. His opinion is that the mainstream media has a duty to challenge power, rather than to serve power. 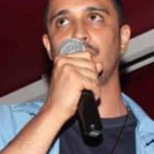 Richard has taught writing poetry for performance at Brunel University. 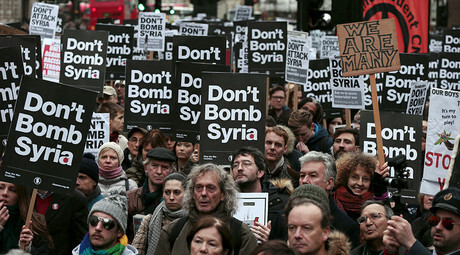 Thousands of people rallied outside Downing Street in London on Saturday to oppose the government’s call to begin airstrikes in Syria – a move which David Cameron will demand imminently. The path leading up to this moment bears all the characteristics of the disastrous and illegal war waged against Iraq in 2003. And this time around, UK Prime Minister David Cameron, is busy trying to build cross-party support in order to ensure that when the vote is called he will have enough MPs on board to back him. He has been steadily whipping up advocacy for his latest foolhardy campaign, the mistakes and lessons of the previous regime of Tony Blair apparently lost on him. Cameron is unable it seems, to firmly grasp history, has a selective memory, and is incapable of seeing the danger in Britain getting involved with airstrikes over Syria. The reality is, that he wants these airstrikes badly, understands the consequences and is determined to lead Britain into another unwanted war of aggression, which lets be clear, is the only way this so called ‘intervention’ will actually be viewed by those on the receiving end of British bombs in Syria. Cameron is quick to call for a ‘humanitarian intervention’ when it involves dropping bombs illegally into nations against the wishes of existing governments and other regional players. He is less quick to call for a ‘humanitarian intervention’ when it comes to helping refugees fleeing the wars our nations helped create. Rather, he has advocated tighter border controls and followed the swing to the right which seems to have taken place across the continent. It’s a sorry state of affairs, and while the war drums beat, many sections of the media are singing the same tune as Cameron. The Murdoch-owned press is overwhelmingly pro-war in its overall coverage of Syria. This is unsurprising given Murdoch’s personal interest in ensuring the West joins this war against the wishes of the Syrian government. Genie Oil which operates in Syria, and which Murdoch is linked to, would stand to benefit from remaining oil reserves with the removal of the Syrian government. Who attended the anti-bombing rally? The British people are wising up to these facts, and yesterday’s protest which was organised by the Stop the War Coalition (STW) was held in solidarity with Syria, and aimed to highlight the fact that despite misleading polls and newspaper headlines, most Brits are against joining other Western nations in bombing Syria. 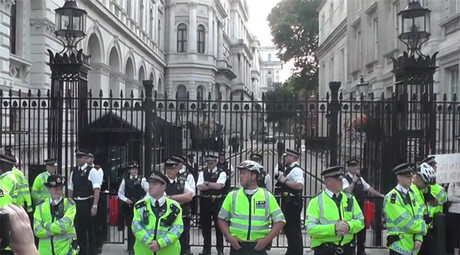 Many notable figures and personalities were present and a petition signed by them was handed to 10 Downing Street. Among the names on the list were Frankie Boyle the comedian and artist and musician Brian Eno. George Galloway, who is running for London mayor was also at the demonstration to offer his support. Meanwhile, other politicians including the Green Party’s Caroline Lucas and Diane Abbott were present. However, Galloway was the only candidate standing for London Mayor who showed up. Sadiq Khan and Zac Goldsmith, the Labour and Tory candidates respectively were nowhere to be seen, presumably due to their support for David Cameron. Labour is deeply divided on the issue of Syria and there is already talk of Jeremy Corbyn offering his MPs a ‘free vote’ on Syria, rather than demanding they fall in line with his position which is to oppose the airstrikes. With Hilary Benn leading the charge, there is a clique of senior Blairite Labour MPs who are threatening a revolt if Corbyn insists they vote with him, threatening to resign. This all takes place amid a plot to overthrow Corbyn that has been building since the very day he became leader. In response, Corbyn has emailed Labour members, asking them to support his view of opposing airstrikes over Syria. It’s likely they will agree with him, and Corbyn clearly hopes to be able to present this as a mandate to his MPs to make his case stronger. But Corbyn’s MPs should not be defying him in the first place. Nevertheless, many people voted Corbyn in on a mandate which opposed war, and so he should not adopt a weak position. He should stick with those that voted him in, and his own MPs should respect the overwhelming wishes of Labour members who are anti-war, or step aside and join the Conservatives. Hilary Benn should be sacked for his defiance over this issue and God only knows what his father, the much-loved Tony Benn, would make of the episode. And it is this very rift between Labour MPs, party members and the grassroots which the division over the question of Syria has exposed: A split in the Labour party has appeared to be on the cards for a long time and the question of Syria could accelerate it. Whatever sense still prevails in the Labour Party, a free vote for Labour MPs on the issue looks certain to hand David Cameron his mandate to bomb Syria on a plate. Whatever good was going to come of Corbyn’s election, this is a moment for Jeremy Corbyn to stand firm with those who voted him in and who stand with and not against Syria, and is not a time to appease Blairite sections of the party. Corbyn should stand firm and demand his MPs vote with him, and deal with whatever consequences may follow. Cynics say this would split Labour, ensuring the Tories stay in power for a generation. Cynics of the cynics would say it makes no difference then; what use is it having Labour in power when they are indistinguishable from the Conservatives anyway? And for the sake of stopping British bombs dropping on Syria, surely risking a split is a small price to pay for a chance of preventing airstrikes over Syria led by Cameron’s government? Governments come and go, but Britain’s legacy of imperialism runs in a straight line from the past and to the present day. Preventing Britain bombing Syria, and stopping our government from supporting all the wrong kinds of so-called moderates in Syria has to be the goal, and has to be the priority. 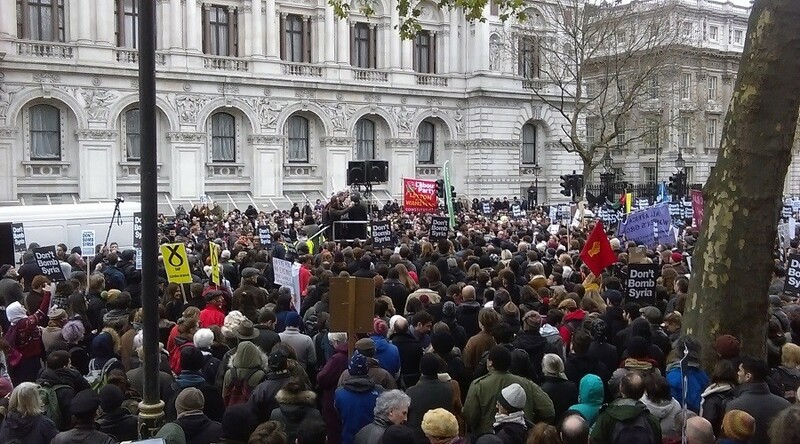 The British people came out in huge numbers yesterday to express their view that we must not bomb Syria. In 2003 a million came out to protest the Iraq war and yet it still went ahead. The pieces on the board look set to move. The last thing Britain should do continue down the path, which has been trodden before and with fatal consequences. Time and time again we have seen the warning signs and yet we stumble from one disaster into another. The way to prevent attacks like those we saw in Paris recently, is not by bombing indiscriminately, but by studying the causes of extremism, being honest about the role our government plays in creating extremism, and ultimately by stopping wars of aggression which fuel the alienation which drives people to join terror groups. The protest yesterday was largely symbolic and must be accompanied by action. But it does indicate the growing tide of anger that people feel toward the government here, having being sold one neoliberal lie after another in order to make the case for war. Demos took place up and down the UK on Saturday. Next week however will be crunch time, and parliament will vote on whether to bomb Syria. The side of history we choose to be on will affect all of us in years to come, that much we can be sure of. At a minimum people should write to and phone their MPs just as they did two years ago and push back against the Westminster machine which does not represent the will of the people, only the insatiable appetite of the military industrial complex and all of its friends.